Bee Gee Fairy Tale Pt. III–The Ball and Concert! I hope you all enjoy Part III of the Hope and Love weekend articles. Now it’s time for the big event, the Ball itself, and Barry’s concert. There is so much to say; it was somewhat overwhelming, so I tried to give you a feel for the highlights of the night. I wish every Bee Gee fan around the globe could have been there with me. Believe me, I was thinking of all of you! I’m not the type to play “dress up” very often. I’m more likely to be the girl in the jeans and white t-shirt (or Bee Gee shirt) who has the most fun when she’s sitting with friends in companionable conversation, munching on biscotti and drinking tea. I think it’s because the expectations of “special events” are always so high that they can never live up to the hype. Think of it. A wedding is the perfect example–a year to plan the “perfect” day, and it’s gone in a flash and not always what it was projected to be. It’s also so much work to get ready: the dress, the hair, the make-up; or in a man’s case, the tuxedo he really doesn’t want to wear in the first place. 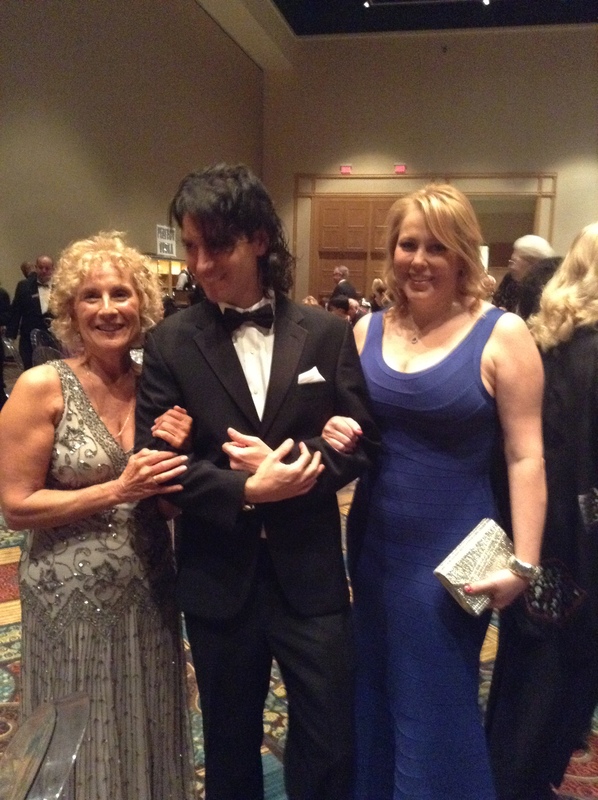 In the case of the Love and Hope Ball, I tried to rein in my anticipation level and just go with the flow of the night. 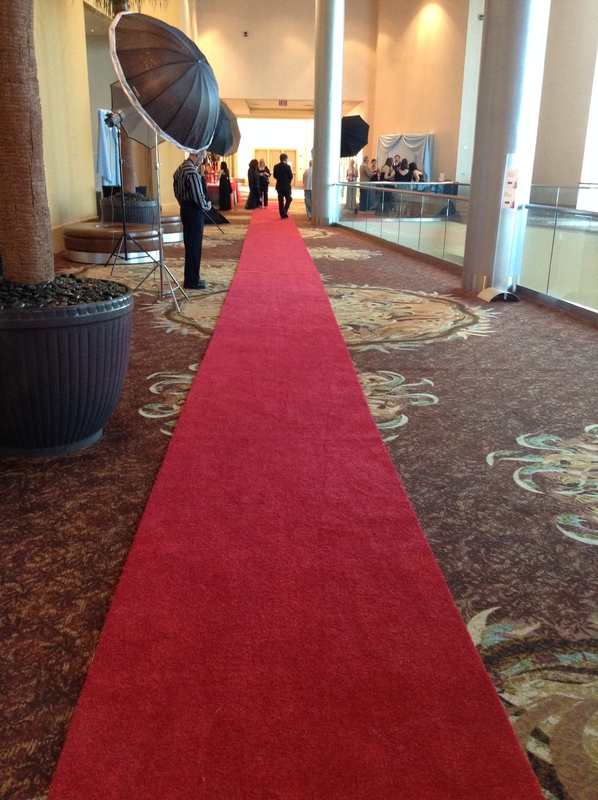 So here’s what happened when I walked the “red carpet” at the Westin Diplomat Hotel on February 15. 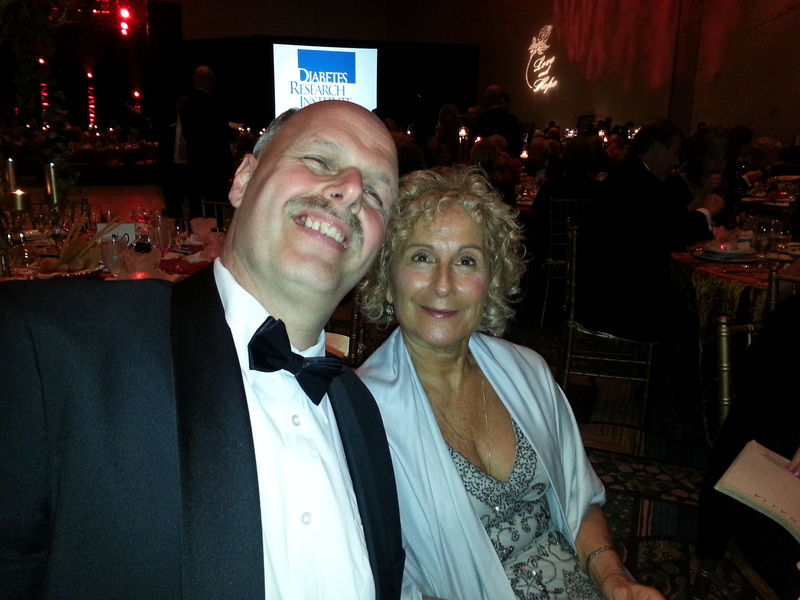 With my wing woman Debbi alongside of me, we arrived early to avoid traffic. I have to admit that I appreciated my dress. 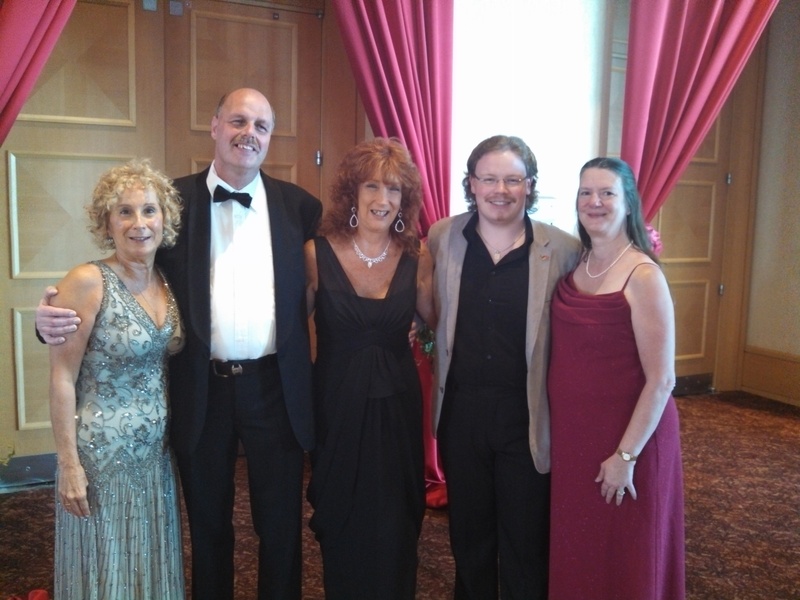 I thought it was like a work of art and Debbi was Greek goddess-like in a beautiful black gown. I loved watching the attendees alighting from their vehicles, dressed to the nines. (What does that mean? As a side note, it’s an 18th Century phrase signifying “superlative”) Competing for my attention were a Rolls Royce and a new Jaguar, dropping off the lucky riders at the front entrance. I knew I would be in the presence of the super-rich, as well as philanthropists and politicians, people famous and not so famous. Also present were guests just like me, Barry Gibb lovers and Bee Gee fans; but perhaps the most influential participants were the patients themselves and their families, those touched by diabetes and determined to overcome the disease and its complications. The scientists and technicians and members of the DRIF staff and scores of committee members and probably every person close to them, were attending. We met other Bee Gee fans in the lobby and shared our oohs and ahhs at how well we cleaned up our acts when we were beautifully attired and groomed. As we waited for others to arrive, down the hall came Stephen Gibb, who, as usual, was good natured and friendly. In his jeans and black t-shirt, I couldn’t imagine him in a tux and was a little jealous at how comfortable he looked. He chatted with us, and I was happy to be around him once again, mainly because his energy is so appealing. Next, we picked up our table place cards and proceeded into the cocktail reception area. A ballroom of its own, there were beautifully decorated tables with silvery white gilttered cloths surrounding a large center area that looked like the buffet serving area for a wedding reception. I was immediately impressed with the ice sculptures and floral arrangements (5 feet high). 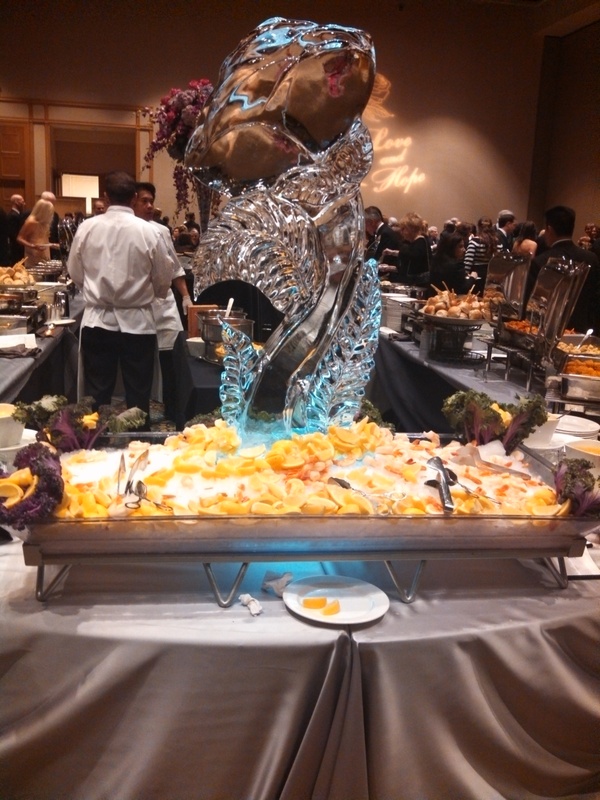 At one end was a massive ice carving, which was surrounded by giant shrimp. There were several bars dispensing whatever the patron’s drink of choice happened to be. 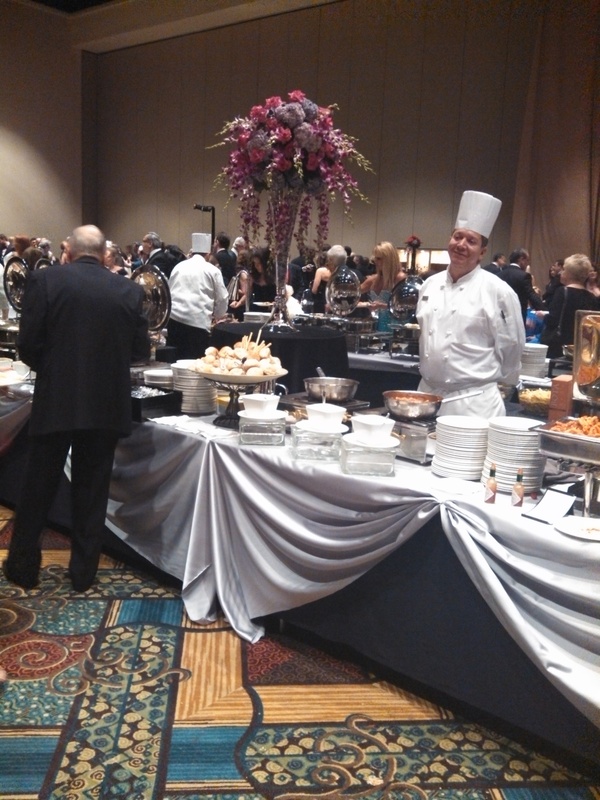 Even the wait staff looked elegant, all in black and smiling as they walked around with trays, offering hors d’oeuvrres, (I salivated over the coconut shrimp). There were several chefs standing at the ready, looking impressive in their tall white chef hats and white coats. They were carving corned beef and an array of fresh meats. There were a dozen different cheeses, risotto cakes, fresh fruit and more metal serving trays than I could count, which contained a variety of hot foods. Impressive…..definitely impressive! The first DRI scientists I saw were the big man himself, Dr. Ricordi, along with Dr. Lanzoni. They were kind enough to pose for photos, and I said a silent prayer for them, hoping they one day will be able to find the cure for Type I diabetes that they are seeking. We had a large group of fans crowded together, and we enjoyed each other’s company and the food until it was time to enter the large main ballroom and find our tables. Walking into the ballroom, I was transported to another dimension. The tables were so elegant, the ambiance ethereal. 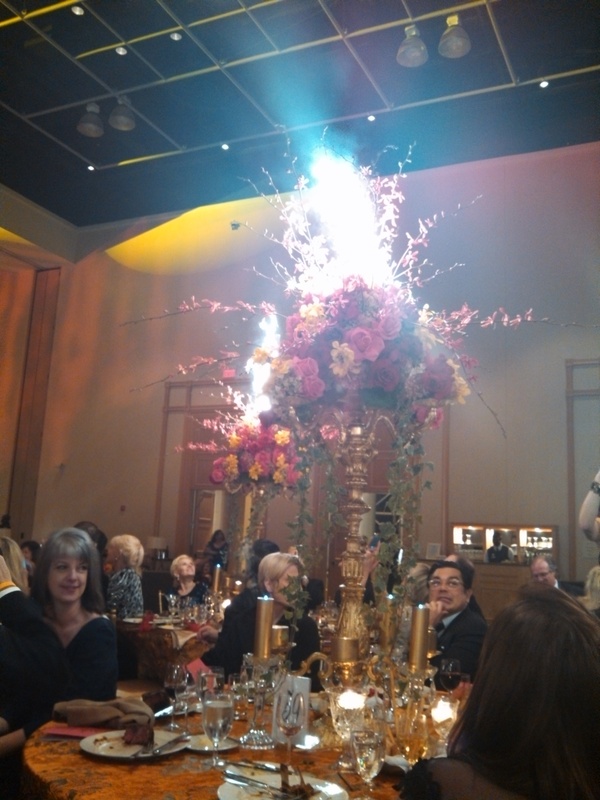 Some tables had 5 ft. candelabras with huge floral arrangements cascading down. There were silver candles, all lit and glowing. Smaller candles surrounded the large ones. Gold napkins wrapped with red ribbons announced the color scheme for the event. It was too pretty a scene to disturb. Huge signs that read “BARRY GIBB” were on each side of the large stage, which was at the opposite end of the ballroom from our table. There were video viewing screens as well, and I got excited just seeing Barry’s name on the sign. Seated at table 63 with me were other Bee Gee fans, some from as far away as Europe. Off to our left was a small stage from which came fabulous sounds. A live band was working the room. The male singer was in the middle of a Sinatra song, but his group covered rock, standards and ballads with equal fervor. They were fabulous and played as pre-concert entertainment for an hour. Strolling over to look at the group of items offered for auction, which were on display to the right of the stage, I saw that Barry Gibb had donated one of his guitars from the Mythology Tour. The value listed on the auction sheet was PRICELESS. No kidding, I thought. Barry’s generosity had already come into play with the concert that was about to happen, and he still offered more of himself, which was just like him. I spotted several Gibbs, but I was most impressed with Yvonne Gibb. She walked by me more than once, and I wanted to talk to her but didn’t have the heart to impose on her privacy. She looked lovely in a simple dark sheath and understated jewelry. She is petite and pixie-like. I think if she had been an actress she would be a a great Peter Pan! I have always been her fan and that admiration continues. 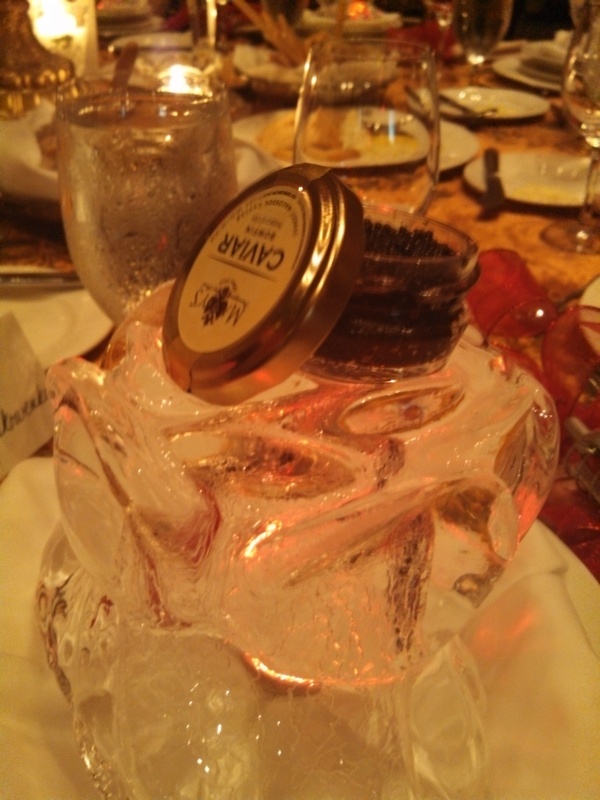 Returning to my seat, I saw that I had my own little ice sculpture in front of me on my dish, topped with a little glass jar of caviar. 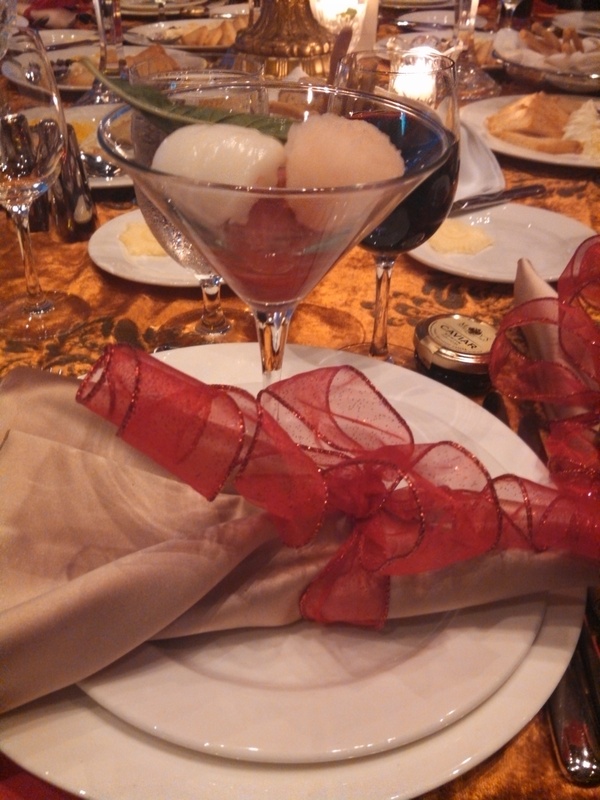 Dinner service began with sherbet served in a martini dish. It was beyond perfection. I loved every mouthful; and if it was possible to make love to a food of choice, I would choose this dish of sherbet. The main course was filet mignon with potatoes au gratin and asparagus wrapped in pimento. I was seated between sweet Carol from Orlando and funny Fred from Holland, and everyone at the table talked over each other with enthusiasm as we ate dinner. I’m not much of an eater when I’m out at events like this. I prefer to people watch, which is what I did for most of the night. I always marvel at what people wear to “special events” and how they came to choose their outfits. It’s not any different than me thinking about Barry’s attire for the stage. I often wonder why he has gone all black when he looks amazing in red and blue. Fans are always telling me they love him in bright colors, and I personally agree. I watched a man in a glitter tuxedo jacket walk by me. I’d never seen one of those before. There was a lovely lady all in white feathers; she looked as though she was floating on air. There there were what I call the “category” dresses: elegant black, bright and bold, short and sassy, retro, and my favorite personal category that I call “beyond Grace Kelly”. I could write a ten page story about the dresses alone. Suffice to say, it was entertaining and fun to watch the ladies. When it came to most of the men, they looked incredible. Put a man in a black tuxedo and he becomes James Bond. After dinner, the presentations were made and honorees crossed the stage. People who have dedicated their personal time, efforts and funds to help the DRIF were honored. My favorite was Dr. Ricordi himself, who gave a short speech about the Institute and its work. He was inspiring. It’s all well and good to attend an elegant affair, but the reason for this event and the need for funds to continue to work is the main focus of this night. At the end of the presentations, the mistress of ceremonies gave a cheerleader-like message to continue supporting the DRIF. She was enthusiastic; and as she ended, the super huge floral arrangements exploded in fireworks. I can’t really describe the effect. I’ve included a photo that doesn’t do justice to the impressive mini-explosions of light that occurred around the ballroom. It was very cool indeed. Fireworks on top of the flower arrangement! The Mythology Band and its brilliant leader took the stage at approximately 9:40 p.m. The energy in the room shifted at once, as it usually does when Barry is anywhere in sight. By now, Bee Gee fans have seen You Tube clips of many of the songs, so what can I say about the performance? Well, I was impressed on many levels, as were the 600 plus fans in the audience. First of all, it was a FULL CONCERT, not a 30-minute offering. Barry was in spectacular voice, commanding the stage and giving me those shivers up my spine I usually get. He started with “Jive Talking” and ended with “Tragedy” What was in between was fabulous. I was thrilled that he did some of the very first songs the brothers ever sang, like “Spics and Specks”, NY Mining Disaster” and “Morning of My LIfe”, the one song with my favorite Bee Gee lyrics of all. I often get emails asking me if Barry included his brothers in any way. It’s usually a given for Mo, Robin and Andy fans to ask this question. 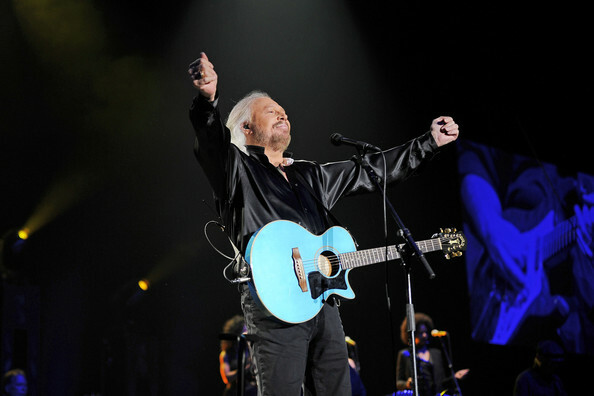 Bee Gee fans were grateful when he mentioned Maurice and his song “On Time” before Stephen sang it. He honored Mo, and the fans were so pleased. He dedicated “Don’t Throw It All Away” to Andy, and it was fitting to do so. That started me talking to myself about not breaking down in tears. Then I nearly ruined my make-up when he sang “Run To Me”. Although Barry sings a verse of this song, it truly seems like a Robin tribute. I could feel Robin’s voice as the song was performed with the other vocalists. Barry also dedicated a song to Jimmy Fallon, “Stayin’ Alive” and I’m sure Jimmy will attend the NY concert and will be beyond thrilled to hear that dedication come his way if Barry does it again. Jimmy is such a true Bee Gee groupie—love him. The dance floor was full during this performance and for all the up-tempo songs. It was fun watching all age groups dance and sing to my favorite music, the timeless sounds that everyone loves. The girls in the band are the best of the best, and Samantha Gibb is so cute I want to put her in my pocket and take she and her family home with me to a kitchen full of oatmeal cookies and hot chocolate. Beth Cohen is a delight; whether she is singing “Guilty” with Barry or “Woman In Love”, she is spectacular. It was nice to hear such a great balance of hits. I can’t imagine how Barry narrows it down because there are literally hundreds to choose from that fans would love to hear. I don’t think anyone attending a concert, Bee Gee fan or not, would be disappointed in any of the choices. Of course, Barry sang “Words” to Linda (right before he ended with “Tragedy” as encore song). “Words” could never get old, probably because the melody is so lovely and the lyric heartfelt. Th cameras shot to Linda, gorgeous in white, sitting with Kelly Lang (how much do we love Kelly!). Linda was too gorgeous to describe. One has to experience “Linda Gibb in formal dress” for himself or herself. Words fail me. As the concert ended, the audience was pumped up and happy, and I thought how truly fortunate they were to have had this experience. As we walked out, people were still buzzing about Barry, and we collected our gift bags (perfume) and framed photos (very nice touch) as we headed for the elevators. Drained but content, all Bee Gee fans had experienced a fairy tale night, complete with our own Prince Charming. Love and Hope are two powerful words. LOVE gives our lives meaning and HOPE gives us the strength to carry on no matter what the odds. How fitting a title for this most inspiring event. Thank you, Diabetes Research Institute Foundation, for your continued dedication to finding the cure; and thank you to the Gibb family for supporting the cause. Barry, we love you unconditionally for many reasons, but your charitable heart is at the top of my personal list. 2 Responses to Bee Gee Fairy Tale Pt. III–The Ball and Concert! That was very well written Anne. You painted beautiful word pictures!! I almost felt like I was there. I enjoyed reading about it very much! Keep up the good work or maybe I should say words!! 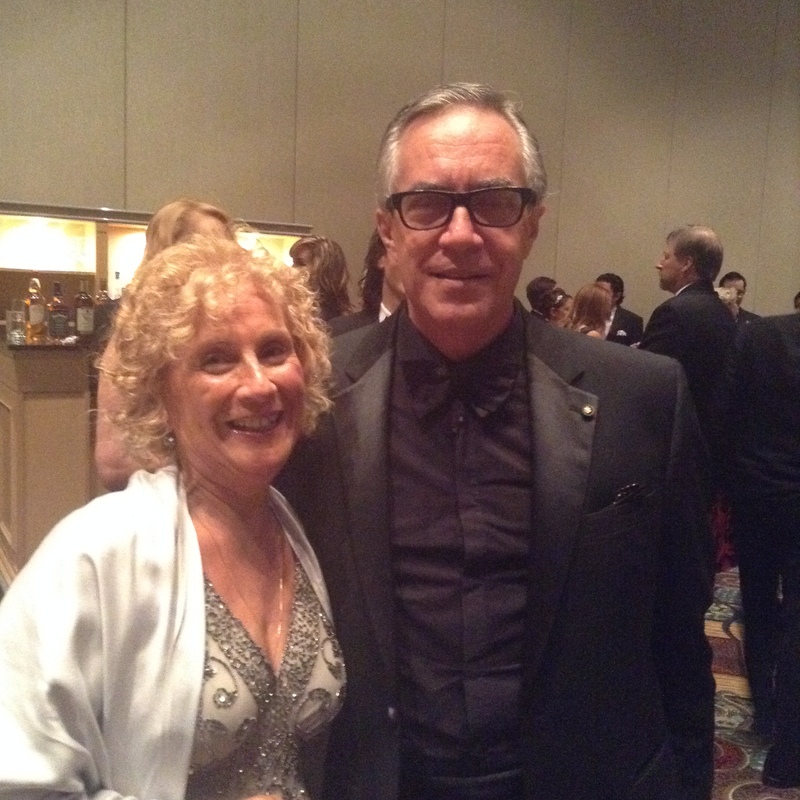 Thank you, Marilyn…Barry was amazing!